How-To: Install a new faucet. When you replace your faucet, be sure to choose a high quality faucet with brass fittings as to make sure longevity is guaranteed. Many manufacturers have warranties for their fixtures, so check with them before you order. PlumbTile features some of the top brand name faucet manufacturers. So stop by Plumbtile first to pick out your new faucet to compliment your bathroom. 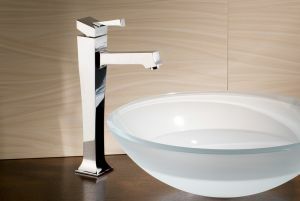 Plumbtile.com stocks the widest array of contemporary and traditional faucet and tap designs. 1. The first step in any plumbing problem you tackle is turning off the water. With faucets, you can shut it off locally with the two valves underneath the sink. Alternately there is the main water shutoff for the whole house, but this will be more convenient. Turn on both faucets to let out any remaining water pressure. Optional: Replacing the supply lines. You should do this, since you’re already getting under the sink and turning off water. You may need to use a tube bender to get it to properly interface with your valves and faucet handles. Make sure no kinks are present, as that will affect water flow. 3. Most faucets are bottom mount. Whichever one you have, it will be fastened from the opposite side of its mounting. Top mounts will be bolted from below the sink, and may require a basin wrench to remove them, if they’re too close to the sink or wall. Bottom mount faucets require a bit more work- you’ll have to take off the handles, then the escutcheons so you can get at the nuts that hold the unit in place. If the sink is old and the threads are rusted or have build-up, do not force them. Use some low-viscosity oil and let it sit for 10 minutes to let it work in there before you attempt to loosen anything. If everything comes off fine but there is residue and build-up, make sure you clean it before continuing. If you sink is old, you may want to consider replacing it too. You can see these sinks and others here. 4. For Top-Mounts: If your faucet came with a gasket, you will not need plumber’s putty or waterproof caulk. If it didn’t, they you will need to apply a little around the faucet base. Then press the faucet in place, making sure the putty provides an airtight seal. Then install the nuts and washers under the sink, tightening the nuts by hand at first. Once you align the faucet with the back of the sink, use the basin wrench to tighten the nuts. Wipe away any extra putty or caulk from the base. For Bottom-Mounts: Hold the faucet in place from under the sink. Install the washers and mounting nuts, tightening the nuts by hand. Align the faucet with the back of the sink and tighten the mounting nuts with a wrench. Put some plumber’s putty or waterproof caulk along the base of the escutcheons and screw them in place. Install the handles. Cold goes on the right. Wipe away any extra putty or caulk from the base. 5. If you’re not replacing the supply lines, just reattach them to your new faucet. 6. Turn your water back on and test your new faucet. Run it at full blast to check for leaks and to make sure it flows like it should. If you used caulk, clean it carefully. You may need a solvent to remove it if got on an undesirable location. Plumber’s putty will wipe away more easily. PlumbTile is also the place to go for your new faucets at low prices and great products.